Joe thought he'd earn loads of Brownie points when he ordered a set of flowers for his fiancée to be delivered by Teleflora on Valentine's Day. 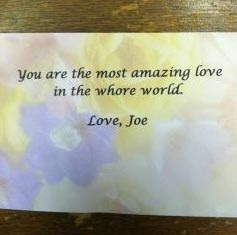 When she received them, she let him know there was a spelling mistake in his message. He was wondering what it could be when she sent him this photo.